The main differences between rice flour and all-purpose flour are most noticeable when baking with the two. For most other purposes, the two flours can be interchanged with little difference in quality of the finished product. The taste and results vary slightly, but overall the two flours perform in many of the same ways when cooking. Use these tips to seamlessly use the two flours in your cooking with good results, and learn some ways exchange rice flour for all purpose flour to make your cooking gluten-free. Rice flour and all purpose flour both work well as thickening agents for soups, sauces and gravies. Both are suitable for making roux and slurry-thickened sauces and can be used interchangeably in recipes calling for either. To make a roux, cook onions and other vegetables in oil before adding either flour and browning it with constant stirring. Add stock or water and simmer until your sauce is thickened. Make a slurry by adding one part flour to four parts water and mixing until there are no lumps. Add in one cup of hot stock from your sauce and stir well before mixing the slurry into your sauce and simmering until thickened. Rice flour and all purpose flour are both used for frying meats and vegetables. Use rice flour on smaller cuts of meat, as it cooks much quicker than all purpose flour and will not withstand the long frying time needed to cook bone-in meats. When frying larger cuts of meat, reach for all purpose flour for the best results. The two flours can also be mixed together for frying to create an alternative coating that works well on a number of smaller cuts of meat and fried vegetables. Water or other liquid such as beer can be added to either flour to create a batter for frying as well. 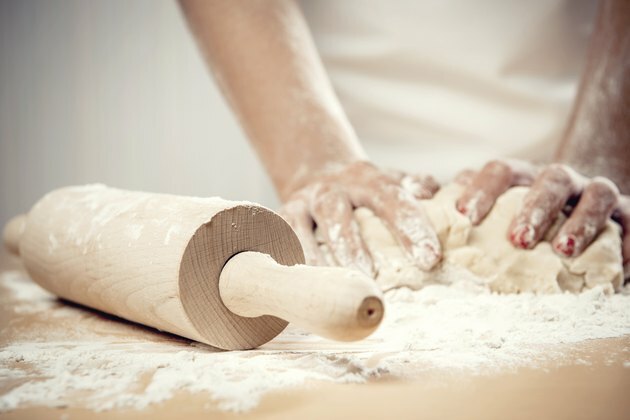 The differences between rice flour and all-purpose flour are most noticeable in baking. The gluten in all purpose flour works to create typical breads; rice flour is gluten-free and will not produce the same results. Rice flour is generally used together with a mix of other gluten-free flours to produce similar results. Be sure to use a recipe specifically formulated for rice flour, because it is not interchangeable with all-purpose flour in baking. Rice flour works great to make muffins, sweet breads and dumplings, while all-purpose flour is widely used to make yeast bread and sourdough bread. Both rice flour and all-purpose flours work well to produce noodles, though the results are quite different. All-purpose flour can be made into noodles either with or without the addition of eggs, while rice noodles are typically made with little more than rice flour and water. Both types of noodles can be made at home with good results. Rice noodles can be rolled into flat wrappers for dumplings in the same way all-purpose flour noodles can be rolled into ravioli. With a noodle press, both can be made into a variety of noodle types; rice noodles cook much more quickly than those made from all-purpose flour.